FORT COLLINS, Colo. - A "potentially historic" storm driving blizzard conditions and thundersnow began roaring through the region Wednesday, a massive weather system that will fuel downpours, high winds and possibly tornadoes as it heads east. Parts of South Dakota and Minnesota could see more than two feet of snow, the weather service said. Some areas were being blasted by snowfall rates of two inches per hour. The weather service also reported "thundersnow" - thunder and lightning accompanied by snow instead of rain. In Northern Colorado, some areas could see up to eight inches of snow and wind gusts approaching 70 mph, the weather service said. If a blizzard hits here, it would be Fort Collins' second in a month. The "bomb cyclone" - a rapidly intensifying weather system - that hit March 13 on its way through much of the region dropped heavy snow and left dozens of vehicles stranded on local highways in whiteout conditions. AccuWeather meteorologist Alex Sosnowski warned that many will see heavy, wet snow that's difficult to plow and heavy to shovel. Travel will likely be snarled as airports and highways struggle under the burden. More than 700 flights into and out of Denver International Airport had been canceled early Thursday. The Colorado State Patrol warned would-be travelers to consider delaying road trips. 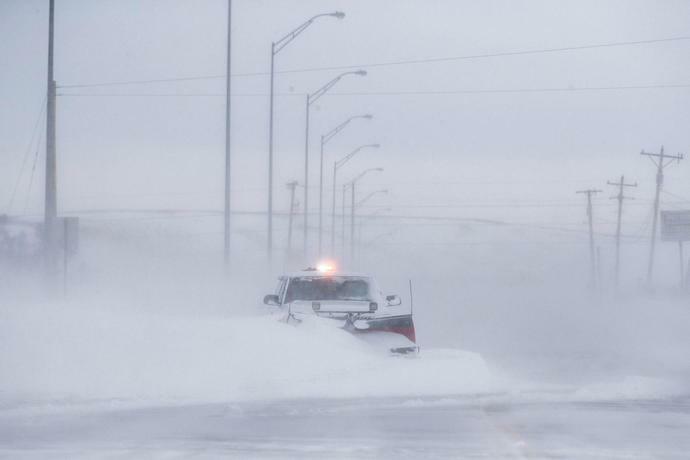 Blizzard conditions from what the Weather Channel has dubbed "Winter Storm Wesley" - even though it's spring - were also poised to blast through parts of Wyoming, Nebraska, Kansas. To the east and south, thunderstorms and high winds threatened areas recovering from recent flooding along the Missouri and Mississippi rivers. On Thursday, parts of Missouri, Iowa, Illinois, Indiana, Kentucky and Tennessee could face "damaging" wind gusts, large hail, heavy rain and possibly tornadoes, AccuWeather said.